Apparently not, and with the might of the VW Group behind it, little can slow expansion at the Crewe firm. It's just announced that in the first half of 2007 it delivered 5600 cars - and this year should be the first time Bentley breaks into five-figure sales. Back in 2002 it made just 1000. Bentley isn’t resting on its laurels, today releasing details of its facelifted Continental GT, along with news of a higher-spec GT Speed model. CAR Online first scooped the changes back in 2006, and they’ll filter through onto the Flying Spur and GTC next year. How can I spot the revised Continental GT? The coupe gets a wider and lower air intake, with a more upright radiator grille, which is the most obvious change. This feeds the unique twin-turbocharged W12 engine which has a new crankcase, camshafts, catalysts and exhausts. Combine this with a new ECU and you get a cut from 410 to 396g/km. Still enough to scare Greenpeace silly, though. But there’s no change in output for the regular car, with 552bhp and 479lb ft. Ample, as they say. The baby Bentley has 405mm discs at the front – which Bentley claim are the largest on any production car – and 335mm discs at the back. Carbon discs are an option, at £10k, and save 20kg of unsprung mass. The standard Continental GT also gets a distinctive ‘B’ brake pedal (above). So lots of power then, but what about the actual driving? Bentley has released a new, more powerful GT Speed version, more of which in a moment, and all Conti GTs get a 35kg drop in weight thanks to lighter suspension and cooling components. This is still a bloater, though; even the basic car weighs a chunky 2350kg. And that increased use of aluminium in the suspension and revised steering are claimed to improve steering feel. Just don’t bet on it matching sports cars half its weight. And what about this new Speed GT range-topper? As befits its name, this is the fastest Bentley ever. It gets a nice round 600bhp, along with 553lb ft to shift its substantial girth. 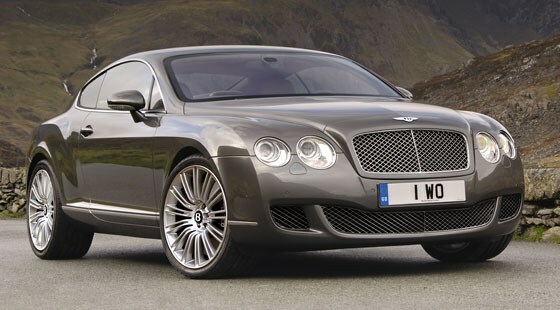 It's enough to send the Bentley from 0-60mph in 4.3 seconds (4.6 for the regular Conti GT) and 0-100mph in 10.3sec. All that torque is put down by the four-wheel drive system, and the ESP stability control has been recalibrated to allow a little more slip for standing starts. The Speed GT is Crewe's first production car to crack 200mph, though CAR in fact managed an indicated 206mph in the original coupe at launch (see CAR Magazine, October 2003). What else do I need to know about the Speed? Despite the fact that the GT Speed’s name was apparently inspired by the racers of the 1920s, the road car will be very luxurious. It comes as standard with a Mulliner Driving interior with numerous exclusive trims and quilted-style seat options, plus drilled alloy pedals. How to spot the Speed? The grille is a darker tint than regular Contis, while the tailpipes are larger than normal. And despite having 20-inch wheels (19in on the standard car), air suspension is there to smoothe the ride; the GT Speed’s ride height is 10mm lower at the front, and 15mm at the back. Prices have gone up. The regular Continental GT costs an extra £3k, so you’ll now need £120,500 to become a Bentley owner. Another £17k will get you a GT Speed, and you can order both from today. But even for that money you get a Saab-esque steering wheel (above). The revised Conti isn't the end of Bentley’s expansion plan. We’ve see pictures of the Azure-based Brooklands coupe, whilst Bentley is already plotting the next-generation of models.